It was just this and that? Do you ever feel like that? I think most cooks have experienced such a situation, when they’ve created something special but can’t remember exactly what they put into it! Fortunately there are people who pay attention when they create new dishes, or we would never have access to all the interesting recipes! This issue is full of exciting recipes, ranging from ever popular Thai dishes to unusual Afghan cuisine and out of the ordinary Italian fare. My friend Padma Shah, a cooking enthusiast, experiments with Mexican Double Decker Quesadillas to come up with unique pizzadillas, proving that when it comes to food there are no boundaries! This is the season for fruits of different hues and we give you innovative ways to use them in recipes, along with their health benefits. For those who don’t have much time to cook but would still like to add variety to their daily fare, we have recipes for dishes that can be instantly rustled up in the pressure cooker. One-dish rice recipes and restaurant gravies that can be made at home will delight readers who like to entertain friends often. 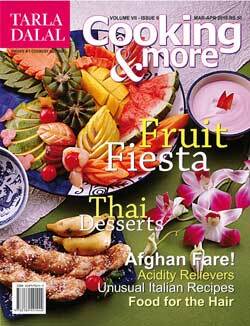 While there is a lot of cooking in this issue, we have much more! Naini Setalvad informs us that remedies for hair related complaints can be found in the kitchen. An interesting new theory promotes five new food groups that must be consumed everyday – find out which inside. Also learn how to beat acidity, a condition that many of us suffer thanks to the stress of modern life. The issue would not be complete without our regular features: healthy snack recipes for diabetics appetising starters for Jains and microwave muthias. There are predictions from astro-numerologist Bhavikk Sanghvvi, and an insight into turquoise. To round it all off is an introduction to punch craft, a creative way to embellish cards and gift items.